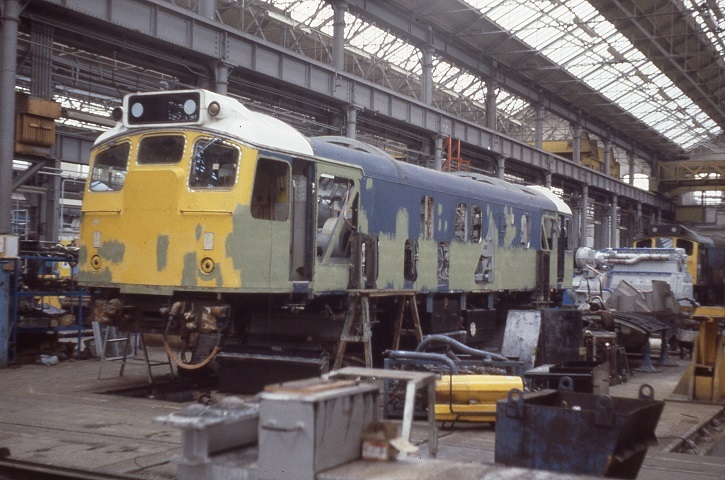 From December 1978 to February 1979 25245 was at Derby receiving its final classified general repair. Seen here on January 20th 1979 midway through its stay the bodywork is a patchwork of colours, a sign of much repair work on the corroded, rusted panels. The twenty one year career of D7595/25245 saw allocations to London Midland Region depots only. Dual brake fitted - June 1973. Time between last Classified repair and withdrawal: 76 months. Time btween withdrawal & scrapping: 14 months. July 1964 to Leicester (15A). June 1968 to Longsight (9A). 25245 was the 251st Class 25 to be withdrawn, one of seven retired during June 1985. After withdrawal 25245 was stored at Basford Hall yard until April 14th - 16th 1986 when it moved to Doncaster Works with 25119, 25226 & 25245 as the 9Z34 Crewe - Warrington (picking up 25044 here) - Doncaster Works, where 25245 was broken up by the third week of August 1986. Noted Derby Works April - June 1973, dual brake equipment fitted. Noted Derby Works September 1977. Noted Derby Works December 1978 - February 1979 (General repair). Noted Derby Works November 1980 (N4 repairs). During September 1962 a report issued on the future plans for the British Railways network of workshops spelt doom for Darlington Works. Although still engaged in the heavy repair of steam and diesel locomotives and with orders to complete for Class 08 and Class 25 locomotives, the Works was still a busy place. Construction had just begun on the first of the Class 25/1's (D5176), with further orders in the pipeline. The frames for the last three of Darlington's new locomotives were laid down during April, with the third to last, D7595 being delivered to Toton during June. On June 29th a roundtrip Nottingham - Weston-super-Mare day excursion was worked by D7595, with Class 35 No. 7092 assisting from Weston-super-Mare to Bristol on the return. An unidentified Wemyss Bay - Glasgow Central service was worked by D7595 on October 10th. On Sunday March 7th D7595 was stabled at Holbeck along with D5184, D5251 & D7577. On the south coast the Type 2s made regular visits on excursions and specials, visiting Eastbourne on May 25th were D7595 & D7574, having originated on the Eastern Region. Condition July: green livery with small yellow warning panels, curved upper corners, panel does not completely cover the frame level stripe, straight sided sandboxes, three-rung bogie mounted footsteps. On the late afternoon of September 9th D7595 & D7520 were stabled at Miles Platting Yard. D7595 was noted at Derby Works during February. During March the Carlisle - Appleby local became diesel hauled, usually by a Type 2, D7595 being so noted on March 19th. Twice during this summer D7595 worked the summer dated roundtrip Nottingham - Landudno Town, on May 27th with D7587 and on August 5th with D5187. During May D7595 was transferred to Longsight. On June 22nd the 09.35 Sheffield - Llandudno Town and the 14.28 Llandudno Town - Sheffield were worked by D7595 & D7542. The 10.00 Sheffield - Llandudno Town and the return 14.28 Llandudno Town - Sheffield were worked by 7595 & 7592 on July 26th. On March 14th a Manchester Piccadilly - Wadsley Bridge roundtrip (?) football special was worked by 7595 & 7597. A month later on April 17th the 17.30 Manchester - York was worked by 7595. On August 8th the 09.20 Manchester Piccadilly - Yarmouth to Lincoln Central and the 09.28 Yarmouth - Manchester Piccadilly from Lincoln Central were worked by 7595 & 5156. The 6E04 Nottingham - Lincoln parcels was worked by 7595 on December 5th. On July 2nd 7595 & 7543 were noted at Llandudno Town on an unidentified passenger working. D7595 was at Derby Works April through June, during that time it was transferred to Toton. On November 18th the 20.43 Birmingham New Street - Leicester was worked by 7595. On May 5th the 20.43 Birmingham New Street - Peterborough was worked by 25245. 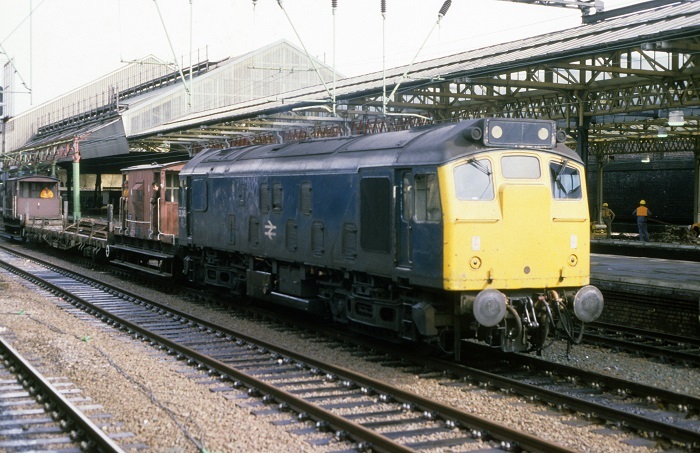 Later the same month on May 25th 25245 & 25137 worked the 14.30 Yarmouth - Birmingham New Street from Norwich. On July 6th the 08.00 Walsall - Yarmouth to Norwich and the return 14.15 Yarmouth - Derby from Norwich were worked by 25245 & 25130. On August 31st 25245 & 25270 worked a Leicester - Skegness roundtrip. 25245 worked a morning rush hour roundtrip Derby - Matlock service on September 3rd. On June 5th 25245 & 25206 worked a roundtrip Derby - Skegness. Two months later on August 7th the Derby - Norwich - Yarmouth - Norwich - Walsall diagram was worked by 25245 & 25099. During October 25245 was transferred to Bescot. 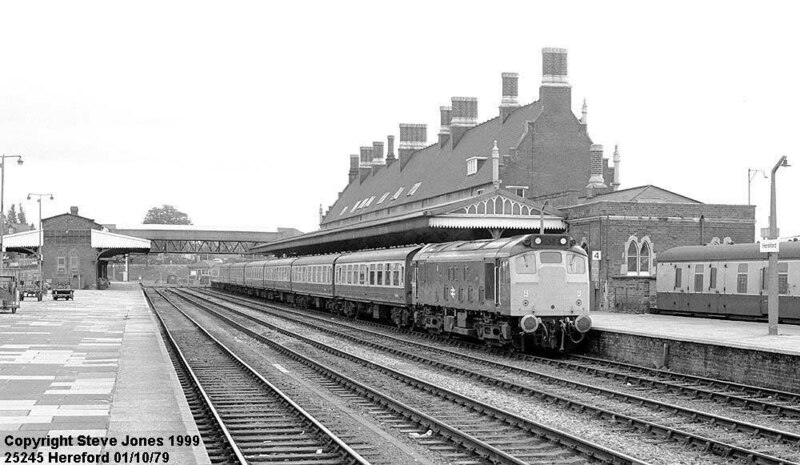 On October 18th 25245 moved withdrawn 24026/31/44/76 from Crewe to Swindon Works. On March 6th 25245 was noted at Bescot. On July 23rd 25245 & 25039 worked the 08.00 Walsall - Yarmouth to Norwich. On the return working, the 14.15 Yarmouth - Walsall from Norwich 25245 failed and was removed at Thetford. 25245 visited Derby Works in September. On April 1st the 15.08 Cardiff - Crewe was worked by 25245. The 10.40 Euston - Aberystwyth from Wolverhampton and the 16.10 Aberystwyth - Shrewsbury were worked by 25245 & 25263 on July 15th. A week later on July 23rd a roundtrip Birmingham - Barmouth day excursion was hauled by 25245 & ?? The Walsall - Yarmouth to Norwich and the return 14.15 Yarmouth - Derby from Norwich were worked by 25245 & 25178 on July 29th. On September 2nd the 10.40 Euston - Aberystwyth from Wolverhampton and the 16.10 Aberystwyth - Shrewsbury were worked by 25245 & 25290. The 'Three Way Special' railtour on September 16th from Marylebone to Rotherwood was worked from Marylebone to Nuneaton by 25245 & 25061. A week later (23rd) the relief 09.00 Birmingham New Street - Paignton was worked by 25245 & 25275. A re-run of the 'Three Way Special' railtour ran on October 14th, 25040 & 25245 were scheduled to work the first leg from Marylebone to Nuneaton, but 25245 was declared a failure at Marylebone and 31273 subsituted. March found 25245 allocated to Crewe. Photograph courtesy Steve Jones For a number of years the Crewe - Cardiff service was in the hands of a variety of Class 25s. Seen here on October 1st 1979 25245 waits time with a northbound departure for Crewe. When these services were taken over by the Class 33s in June 1981 25245 worked one of the last diagrams. On January 17th the 16.02 Crewe - Cardiff was worked by 25245. It woulds be a regular performer on this route throughout the year, the the recorded sighting no doubt do not match by a long way, the workings handled. The 12.36 Birmingham - Norwich was hauled by 25245 on April 7th. The Kensington Olympia - Willesden route was covered on May 7th with 25245 & 25250 handling a motorail service. On May 25th 25245 was noted southbound at Winwick Junction with the LMR observation saloon. 25245 & 25121 were noted at Machynlleth with a Rambler Charter Train on May 26th. The New Year started with 25245 already busy on the Crewe - Cardiff run, being so noted on a service on January 2nd. Although the vast majority of these services were hauled by one locomotive 25245 & 25220 were on together on June 21st & 23rd. On October 5th 25245 worked the 03.57 Crewe - Birmingham New Street. 25245 received minor repairs at Derby Works in November. 25245 continued spending considerable time on the Crewe - Cardiff services, certainly assisted by its continued allocation to Crewe depot and still retaining an operational boiler. 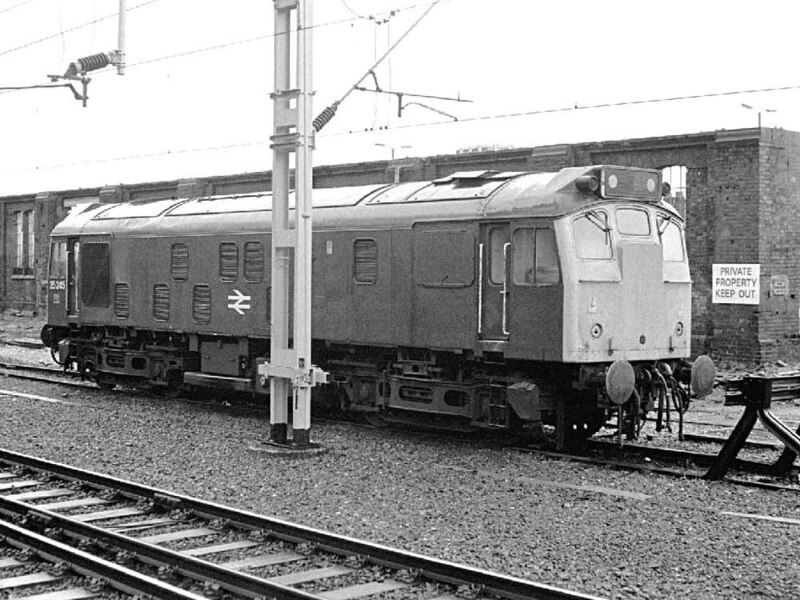 Its first recorded Crewe - Cardiff working for 1981 was the 17.10 Cardiff - Crewe on January 20th. Typical of the daily miles run up was April 25th when 25245 worked the 10.00 Crewe - Cardiff, the 15.10 Cardiff - Crewe and the 19.30 Crewe - Cardiff. Photograph collection of Roger Geach 25245 southbound at Hereford on April 25th 1981 with the 10.00 Crewe - Cardiff. On May 28th 25245 worked the 16.02 Crewe - Cardiff, followed by the 20.00 Cardiff - Crewe postal, the latter had been diagrammed for a Class 45 but this had been used on another northbound working. The last day of May was officially the last day for the Class 25s on the Crewe - Cardiff workings. The Southern Region were intending to release Class 33s from discontinued van traffic workings to take over from the Class 25s, however a strike on the SR and continued operation of the van traffic permitted some Class 25's to remain on these workings until June 4th. Throughout the last week 25042/60/66, 25219/220/245 handled the diagrams although by midweek 25220 was replaced by 47099. On June 1st 25060 was replaced by 33022 on the 16.02 Crewe - Cardiff with others gradually taking over. 25245 had been very active on this route between May 28th & June 1st, on June 3rd at least the 16.02 Crewe - Cardiff service was worked. The final Class 25 workings were on June 4th, 25245 on the 17.10 Cardiff - Crewe and 25060 on 16.02 Crewe - Cardiff, the latter failing at Hereford, passengers being rescued by a diesel multiple unit off a terminating Birmingham service. The loss of the Crewe - Cardiff diagrams cut back on 25245's passenger workings, but other routes still provided opportunities. On June 6th the 04.10 Shrewsbury - Aberystwyth and the 10.07 Aberystwyth - Euston to Wolverhampton were worked by 25245 & 25145. The next day (7th) the same pair worked the 08.45 Birmingham New Street - Aberystwyth and the 18.00 Aberystwyth - Euston to Nuneaton, dragging 86252 from Wolverhampton. On August 8th the 08.35 Derby - Yarmouth to Norwich and the return 14.20 Yarmouth - Derby from Norwich were worked by 25245 & 25060. The next day (9th) the same pair worked a roundtrip Leicester - Skegness service. The 11.03 Bangor - Manchester Victoria was worked by 25245 on October 30th. Photograph courtesy Tony Sayer There aren't too many views of Coventry on this website, but here is 25245 in the pouring rain on October 4th 1981, the paintwork seemingly still glistening, despite having been out of Derby Works for two years. 25245 was noted passing Aspley Guise on November 28th with a short engineers train. Ona snowy December 12th 25245 (leading) and an unidentified Class 25 headed a rake of empty bogie oil tanks (possibly Cowley Hill to Stanlow) through St Helens Junction. 25245 received an 'E' exam at Crewe depot during May 1982. On August 25th the 07.16 Manchester Victoria - York was worked by 25245. Three days later (28th) 25245 & 25141 worked the 07.38 Shrewsbury - Aberystwyth and the 10.07 Aberystwyth - Euston to Wolverhampton (25141 was replaced by 25307 at Machynlleth). The failure of 87001 on September 4th at Bletchley saw 25245 & 25173 assist the 10.10 Glasgow Central - Euston from Bletchley. October 2nd produced some passenger miles for 25245, starting out with the 09.44 Llandudno Junction - Manchester Victoria, the 15.13 Manchester Victoria - Barrow and the 18.30 Barrow - Liverpool. 25245 was noted westbound through Manchester Victoria on October 28th with a mixed rake of vans & wagons. The 08.40 Carlisle - Glasgow Central and the 13.45 Glasgow Central - Carlisle were worked by 25245 on November 22nd, 23th & 25th. On November 26th 25245 was noted at Speke Junction. Tragedy struck the WCML early on the morning of December 9th when the 8th's 22.55 Euston - Glasgow hauled by 81016 derailed at speed at Old Linslade. The locomotive hit a bridge causing severe damge to the locomotive and regrettably fatally injuring the driver. Next morning under grey winter skies a variety of breakdown trains attended the scene, 25044 brought in the Bescot breakdown crane, 47135 with the Stratford breakdown train and 25245 with Bletchley rerailing train. 08235 would also attend on December 10th to take 81016 to Bletchley. Other Class 25s involved were 25309 & 25319 on the Bletchley rerailing train and 25257/25137, 25075/25076 on ballast jobs a day later. During January 25245 saw occasional use on local workings in the Liverpool, Manchester & Barrow area. On January 6th 25245 worked the 18.30 Barrow - Liverpool. On January 19th 25245 worked the 13.45 Manchester Victoria - Bangor and the 16.52 Bangor - Manchester Victoria. The 22.47 Crewe - Blackpool North was worked forward from Preston by 25245 on January 20th, 21st, 22nd & 24th. On March 2nd 25245 worked the 16.02 Leeds - Carlisle. It was busy on the North Wales mainline on March 7th, 17th & 18th, although whilst working the 17th's 19.26 Bangor - Manchester Victoria, 25245 failed at Chester and was replaced by 25138 & 25146. 25245 was noted dragging a class 304 unit northbound through Crewe on April 2nd. Later that day the relief 21.00 Euston - Holyhead was worked from Crewe by 25245 & 25089, however 25089 would fail at Chester. When 47197 failed on April 4th at Chester working the 13.49 Bangor - Manchester Victoria, 25245 worked the train forward. 25245 returned to the Crewe - Cardiff service on May 23rd working the 08.01 Crewe - Cardiff and the 11.40 Cardiff - Crewe. Two days later (25th) 25059 & 25245 worked the Cranmore - Ellesmere Port bitumen tanks. A Derby - Newcastle test train ran on several days during July, comprised of three laboratory coaches and four Class 317 vehicles, the tests described as 'brake cooling'. On July 20th 25245 was noted on this test train. Another solo run took place on August 9th with 25245 working the relief 15.30 Crewe - Holyhead. The next day (10th) 25245 & 25224 worked the 10.20 Llandudno Town - Euston to Crewe. On September 12th 25245 was noted at Cwmbran with a lengthy train of short wheelbase wagons. September 18th was a busy day for 25245, starting out with the 09.20 Holyhead - Manchester Victoria, the 14.36 Manchester Victoria - Llandudno Town and the 18.27 Llandudno Town - Manchester Victoria. On October 1st a roundtrip Coventry - Aberystwyth day excursion was worked by 25245 & 25266. A railtour on October 29th, 'The Bedford Bricker', from Plymouth to Kettering was worked roundtrip over the Bletchley - Stafford route by 25245 & 25048. Over the Christmas holiday 25245 & 25321 were stabled at Buxton station with a snowplough at each end. 25245's varied passenger workings in 1984 began with two failures. Whilst working the 17.15 Manchester Victoria - Blackpool North on February 7th it became a failure at Preston, being replaced by 47199. On February 18th 25245 & 25319 were noted eastbound through Chester with loaded bogie oil tanks from Stanlow for ? On March 8th 25245 again failed at Preston, this time on an early afternoon Blackpool North - Manchester Victoria working! A week later on March 14th 25245 worked a morning Manchester - York service, the following day (15th) 25245 worked a morning Manchester - Bangor service, returning eastwards on a Scarborough service, but only as far as Manchester. A busy weekend in April found 25083 & 25245 amassing over 770 miles of passenger mileage. The weekend began on April 21st with the pair managing a round trip Wolverhampton - Aberyswyth excursion (from Manchester). The next day (22nd) began with a short hop between Coventry & Birmingham New Street on a Scarborough bound excursion. Little time was spent at Birmingham as they took over a Blackpool bound excursion from Leamington, returning all the way back to Leamington, some good sustained speeds were managed over the WCML. Seeking out more holiday resorts the next day (23rd) the pair took over a Derby excursion at Shrewsbury bound for Tenby via the Central Wales line. The Class 25's were taken off at Llanelli for refuelling, 47140 covering the final miles into Tenby. After refuelling at Landore the Class 25's rejoined the train at Llanelli returning home via Cardiff and Birmingham. On May 12th 25076 & 25245 were used on the 'Ten Counties' railtour between Walsall & Marylebone. Two weekends later on May 26th 25202 & 25245 worked the 10.10 Euston - Aberysywyth forward from Wolverhampton, bringing the return working back to Shrewsbury. 25245 was noted passing Saltley on May 31st with a weedkilling train. 25198 & 25245 were noted passing through Nuneaton light engines on June 10th. A more mundane working occurred on August 10th covering for a failed late afternoon diesel multiple unit between Derby & Crewe. On September 5th 25054 & 25245 were noted on the weekly Aberystwyth - Stanlow empty oil tanks. A down 'Speedlink' service was noted on September 25th through Huddersfield behind 31156 & 25245. Two days later (27th) 25245 and the LMR Inspection saloon were noted southbound at Great Rocks Junction. North of the border on October 16th the 17.40 Carlisle - Glasgow Central was entrusted to 25245. A short working on November 18th saw 25245 drag 85039 and the 18.15 Manchester Piccadilly - Euston between Manchester Piccadilly & Macclesfield because the power was off for engineering work. Further railtour duty on December 1st saw 25089 & 25245 working the RTR 'Buxton Bullett' between Bescot & Stockport. Photograph collection of Roger Geach 25245 with a short engineer's train at Crewe sometime during 1985. February 2nd found 25245 working a round trip between Carlisle & Glasgow Central. The 06.05 Carlisle - Glasgow Central was covered on February 6th whilst another afternoon round trip over the GSW took place on February 27th. On March 25th 25245 was noted at Cricklewood. 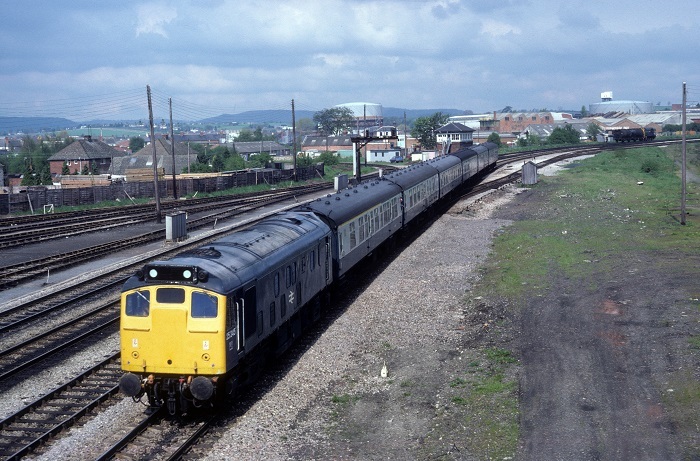 On April 23rd two pairs of Class 25s were noted at Chesterfield, the morning Arpley - Parkeston Speedlink behind 25175 & 25032 and the late evening Bristol - Newcastle parcels with 25201 & 25245. Class 25s briefly returned to the 15.02 Manchester - Bristol parcels at the beginning of May, 25201 (1st), 25245 (2nd) & 25302 (14th). On May 4th 25245 was stabled at Toton. On May 5th 25201 & 25245 worked the 18.28 Liverpool - Barrow, the next day (6th) the same pair worked the 16.40 Nottingham - Barrow, returning on the diagrammed 21.50 Barrow - Crewe as far as Preston. 25191 & 25245 were noted stabled at Severn Tunnel Junction on May 25th. 25245 was noted with a short southbound mixed freight (five wagons and a brakevan) passing Toton on May 31st. 25245 was withdrawn on June 25th 1985. Page added July 21st 2002.